This foundation has been out for quite some time, but I was on the fence about purchasing it because there were so many mixed reviews. I was really looking for a foundation with incredible staying power as well as coverage and this one seemed to meet those characteristics based off of its description and name. So, I ignored the reviews completely and decided to try it out for myself! I purchased this foundation about three weeks ago (in the shade 4.0) and have been testing it out since. Keep reading for my full review on this foundation and to find out whether or not I think it is worth repurchasing! I will start with my preferred method of applying this foundation. I tried applying it with both a kabuki brush and beauty sponge and definitely prefer the brush. I find that it drastically improves the coverage and blends the product out easier and faster. This foundation gives FULL COVERAGE. A little bit goes a long way, so the 1 ounce bottle will last quite a while. You do not need to build this up whatsoever, otherwise it might look a little too cake-y. While the description says this foundation gives a completely matte finish, I find that it is more of a natural-matte finish on my skin. I do not mind this at all though because I do not like when matte foundations make my skin look flat and dull. One of my favorite things about this foundation is how long it lasts! To me, this foundation lasts twice as long as the Estee Lauder Double Wear foundation. This was a major element I was looking for in a foundation and this one met that need 100%. The description did not specify in hours how long the foundation was supposed to last, but I did end up sleeping in my makeup one night (I know this is terrible for your skin and I do not recommend sleeping with your makeup on) and when I woke up the next morning my skin still looked flawless. This being said, the claim that it will last “all night” (hence the name) stands to be true in my opinion. The foundation also claims to diffuse light to blur imperfections. I agree with this statement 100%! Right when I apply the foundation, I notice that my skin instantly looks flawless and my pores are blurred. Even though this is a full coverage foundation, when I look into a magnified mirror, my skin still looks like skin and I cannot see the foundation just sitting on top of my skin. I did find a few downsides to this foundation as well. While the shade range is pretty extensive, the undertones of the shades are not. The undertones are either very pink or very yellow. I have neutral-olive undertones and the shade that matched me best was 4.0. This shade, for me, is very yellow though and I do need to blend it down my neck and a little on my chest for everything to match. In Urban Decay’s defense, their description does claim that it will oxidize and that you should wait for it to dry down before choosing a shade. 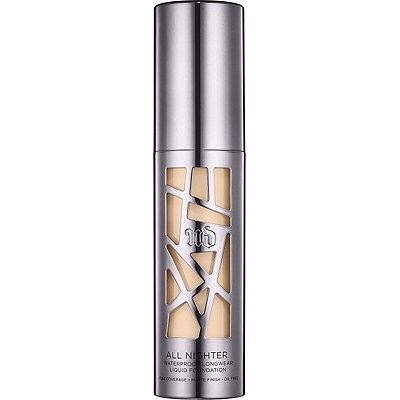 I have noticed that fuller coverage foundations tend to oxidize the most, so this is not a deal-breaker for me. 4.0 is slightly too yellow, but it was the only shade that matched me the best. The description also claims that the foundation is comfortable enough for everyday wear. I do not really agree with this claim for two reasons: 1) I personally do not like to wear full coverage foundation, or foundation at all, everyday and 2) I find that it is slightly too heavy to feel comfortable even if I did wear it everyday. This foundation is no BB Cream, and for that reason I think it is just slightly too heavy and full coverage to be comfortable wearing just on casual days. The claim that this foundation absorbs oils is something else that I do not exactly agree with. I still do get pretty shiny in my t-zone, BUT the foundation does not break up in that area which is a huge plus for me! So… would I repurchase??? The answer is YES! While there were a few cons, I really do like this foundation and will most likely continue to repurchase it. When I go all out with my makeup, this has been my go-to foundation since I purchased it. I love how full coverage it is while not looking like a thick layer of makeup on my skin. The undertone is slightly off, but this is something I can fix by mixing in other foundations/foundation mixers. This being said, I do think that UD should add in shades with more neutral undertones to accommodate many more skin shades. If you have been on the hunt for a full coverage and long lasting foundation- give this one a try! AND if you have been hesitating to splurge on this foundation specifically like I was, remember you can always get a sample from Sephora or try it out in-store first!